When you soldering, you may need a "hand" to help you catch devices.These six-arm aluminum soldering station helping hands will satisfy your needs. 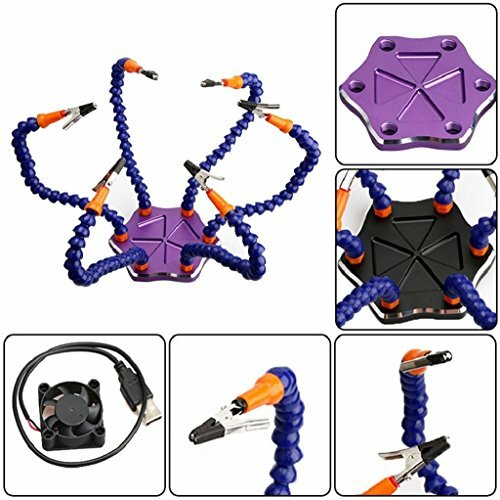 It has six arms and the alligator clips can rotate to any angle. There covers heat-shrink tube on the alligator clips thus to protect from the components holding. Fan cool down quickly for components and blow smoke. Rechargeable Flashlight can help you do better job. High quality solid helping hands soldering station, non-slip aluminum base for welding,soldering and quadcopter hobby crafts. Equipped with hexagon aluminum alloy basement, it won't tip over even with a heavy project. Four pockets in aluminum base to hold small parts void to loose components. There are six soft rubber pads at the back in case of slipping. With this helping hands, you can finish your job quickly. If you have any questions about this product by Fiaya, contact us by completing and submitting the form below. If you are looking for a specif part number, please include it with your message.